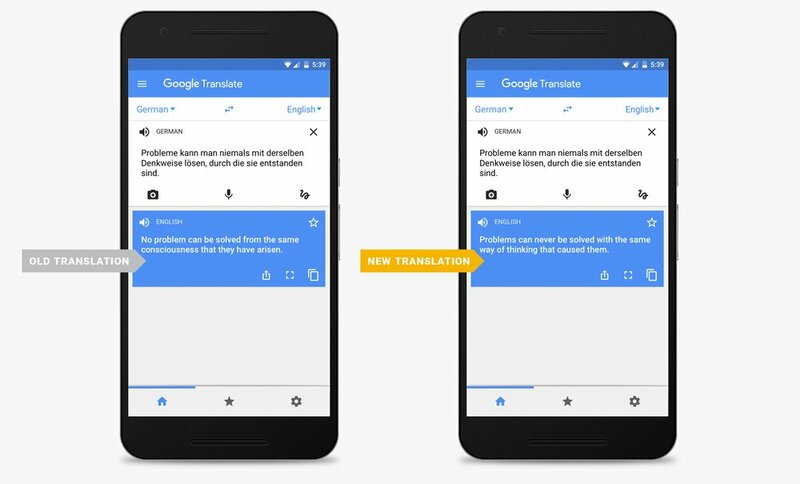 Just two months ago, Google announced the introduction of Neural Machine Translation to their Google Translate service. This is great news for businesses that need to translate their website, or those on a tight translation budget. But what exactly is “Neural Machine Translation” and what does it mean for professional translators? Neural Machine Translation (NMT) is an approach that optimizes the benefits of machine translation, by using a large neural network. At its most basic level, NMT focuses on translating whole sentences instead of taking text on a word-for-word basis. It uses the wider context from these whole sentences to determine what the best translation outcome should look like. On top of this, the neural network relies on a learning system that allows it to actually get better over time. This will undoubtedly mean NMT becomes even more widely-used in the future, with regular machine translation phasing out. Why is NMT better than regular machine translation? Regular machine translation looks at each individual word in a block of text, with no regard for the overall structure of a sentence or how it reads. Often, regular machine translations result in clunky and nonsensical text that has little or no application in the real world. Machine-translating a blog, for instance, would end in a drastic quality reduction of the blog content. On the other hand, NMT has the ability to retain the context and tone of voice that a normal machine translation loses. Its unique learning technology gives a more human-like understanding of words and sentences, resulting in a higher quality translation. You can expect NMT to deliver more fluid, fluent and accurate translations that present something closer to what a professional translator can do. In the picture below from Google, you can see there’s quite a difference in the tone of voice and quality between the regular machine translation and the NMT. To start, Google have made NMT available for eight different language pairs. These range from English and French, Portuguese, Chinese, Japanese, Korean, Turkish and German. Using only these eight languages, about one third of the world’s population can avail of NMT. Google also mention that these languages cover more than 35% of the world’s Google Translate queries. The platform has 103 languages in total, and the plan is to integrate all of these with NMT over the next few years. Google are also granting access to NMT via their Google Cloud Platform, so developers can use the technology within their own applications. With NMT, the company claims that Google Translate progressed more in a single year that it has in the last ten years combined. To help NMT grow, Google has revealed its continued reliance on the Translate Community. Here, multilingual speakers can review translations or contribute their own translations to the community. What does this mean for professional translators? Does this mean the end for professional translators? Absolutely not. As mentioned, NMT is a learning system. This means that, for a while at least, translations won’t be on par with that of a professional translator. Yes, it will learn over time to deliver similar quality, but there are some areas that it can’t compete in. Professional translators that have expertise in certain cultures or industries will always have the advantage. They can include colloquialisms, inside knowledge and revert the tone to match different audiences within that language remit. NMT will express translations in a clear and concise way, but it can only translate whatever information it is given. Professional translators can tweak content and information to match the needs of every target audience. NMT is a fantastic advancement in machine translation technology and it will only get better over time. As it stands, NMT is a cost-effective way to translate your website, safe in the knowledge that your content will retain most of its original quality. However, it’s still in the early stages and there will most likely be some bumps in the road. Professional translation is the only sure-fire way to translate your website and provide a truly local experience for your customers. There's simply no substitute for the expert knowledge a professional translator can give across cultures and topics. With a network of over 18,000 professional translators, we can vouch for their continued relevance in today's technologically-advanced world.